Lead me in your truth and teach me, for you are the God of my salvation; in you have I trusted all the day long. Remember, O Lord, your compassion and love, for they are from everlasting. (Psalm 25:4-5, The Book of Common Prayer, p.614). Among my many social challenges I experience because of autism is knowing when, who and how to ask for help. It happens because of being overwhelmed by too many options in my brain at one time. Over the past seven years since I was first diagnosed, I have had to learn that the sooner I tell those closest to me that I am overwhelmed by my options and need help, the less overwhelmed I will be. I will get the help I need, when I accept my vulnerability and entrust what I need from the right people. “No, you took upon yourself our kind of life, just as it is. You let it slip away from you, just as ours vanishes from us. You held on to it carefully, so that not a single drop of its torments would be spilled. You hoarded its very fleeting moment, so you could suffer through it all, right to the bitter end” (p.71,72). If we want a contemplative experience of Advent, we must “begin again.” We begin by praying with the Psalmist that by ourselves, we do not know how to find God’s truth and know God’s compassion. The contemplative looks for the mystery of God in our humility and vulnerability as life is in the here and now. In our suffering and messy lives the Advent of Christ is already happening. When we let go, and allow God to teach us the way of truth, salvation and compassion; the Holy One comes and makes a home within us. It is a very limited experience, and so we continue to cry; Come, Lord Jesus, Come. “Let them prefer nothing whatever to Christ, and may he bring us all together to everlasting life.” (RB 1980: The Rule of St. Benedict in English, Chapter 72, p.95). What are you waiting for Jesus to do for you this Advent? Jesus said to her, ‘I am the resurrection and the life. Those who believe in me, even though they die, will live, and everyone who lives and believes in me will never die. Do you believe this?’ She said to him, ‘Yes, Lord, I believe that you are the Messiah, the Son of God, the one coming into the world.’ (John 11:25-27 NRSV). Jesus gives new hope to Mary and Martha in today’s Gospel story. They already demonstrated their courageous faith. Their belief in who Jesus was, enabled them to believe that if Jesus had been there when Lazarus was dying, He could have prevented his death. Mary and Martha’s faith and hope in Jesus was evidence of their openness to more than what they saw by sight. Jesus responds by proclaiming that He is the resurrection and the life, and follows His claim up by raising up Lazarus’ body. I believe that all of what we read about in John’s Gospel today is faith becoming visible and tangible. There are new opportunities, because faith opened the flood gates. This is where the contemplative experiences the presence of Jesus in which no words are necessary. As contemplatives, we know that all we have to do is crack open that barrier just a little, and The Holy Spirit will gush in the holiness of God in abundance. If we believe just a little bit that Jesus can change what is right in front of us into a moment of resurrection and life; we will experience this new life in the mystical moment of God’s grace. In chapter 35 of The Life and Miracles of St. Benedict, is the story of how he was standing at the window of his monastery before the night office. He was so deep in his watching, that he had the experience of a great light through which he could see all the world in that one moment of light. The mystical experience was so transparent for St. Benedict, that he saw the soul of Germanus ascending into heaven. Just a little bit of openness and watching, and Benedict saw resurrection and life in front of his eyes. What is the barrier you are willing to open just a little, so that Jesus can be resurrection and life for you? Let us give thanks to the Father, who has enabled you to share in the inheritance of the saints in the light. He has rescued us from the power of darkness and transferred us into the kingdom of his beloved Son, in whom we have redemption, the forgiveness of sins. He is the image of the invisible God, the firstborn of all creation; for in him all things in heaven and on earth were created, things visible and invisible, whether thrones or dominions or rulers or powers—all things have been created through him and for him. He himself is before all things, and in him all things hold together. He is the head of the body, the church; he is the beginning, the firstborn from the dead, so that he might come to have first place in everything. For in him all the fullness of God was pleased to dwell, and through him God was pleased to reconcile to himself all things, whether on earth or in heaven, by making peace through the blood of his cross. (Colossians 1:12-20 NRSV. “Let us give thanks” comes form The Liturgy of the Hours). Why is the Advent, Christmas and Epiphany seasons so much easier than Lent, Holy Week and even Easter? I think it has something to do with the fact that we do not think as much about the Cross during Advent and Christmas as we do during Lent. Nevertheless, the Cross is quite inseparable from any part of the Church Year. The Christmas tree that is often thought to be so pagan; is actually symbolic of the wood of the Cross. The evergreen leaves are a reminder of the promise of everlasting life because of Christ’s death on the Cross. The wood of the manger in the Nativity narrative is also symbolic of the Cross. The words of the canticle from Colossians remind us that Christ came as God among us. Christ was the visible image of God, and that in Christ all the fullness of God’s divinity was pleased to dwell. This Season of Advent is about remembering that Christ came to us as one like us in the Word made Flesh. Christ made peace by the way of forgiveness of our sins through the shedding of His blood on the Cross. This is our reason for watching during Advent, because the Christ we are awaiting is our Savior. He is the One who brings all of us into a deeper relationship with God because in Christ, God has identified with all of us; to the point of giving His life on the Cross. Advent is made for the Christian to contemplate the mystery of God coming among us, and returning to us to claim God’s people who are redeemed by the blood of the Lamb. Advent is our opportunity to respond to God in prayer and silence through the watching and waiting for all that God has for us to become a living reality. We need not wait for God to come to respond to Christ and the Cross. Christ is already here among us, as the Kingdom is already, but not yet. Jesus answered, “Those who love me will keep my word, and my Father will love them, and we will come to them and make our home with them.” (John 14:23 NRSV). One of the greatest gifts of contemplative prayer is the experience of Jesus coming home to live in us, as God elevates us to a higher vision of God. The heart is infused with that love that is so amazing, so perfect and complete; that all one can do is sit in the stillness of the moment and in faith, receive and savor the experience. Keeping the word is more than about the words written or spoken. Keeping the word is about allowing the Holy Spirit to make a home in our hearts for Jesus Christ, The Word. It is about keeping our hearts and minds open to welcome the presence of God in prayer and contemplation. It is about the love of God permeating every fiber of our being and changing us from the inside out. It is about keeping watch for The Word to take up residence in every aspect of our lives, remaking us into the “new creation” that St. Paul writes about in 2 Corinthians 5:17-18. Keep watch by keeping the Word and loving Him who loves us. First of all, every time you begin a good work, you must pray to God most earnestly to bring it to perfection…. Let us open our eyes to the light that comes form God, and our ears to the voice from heaven that every day calls out this charge: If you hear his voice today, harden not your hearts (Ps.94 :8). (RB 1980: The Rule of St. Benedict in English. Prologue:4-10). I am reading through a book during Advent. The title of the book is, Benedict’s Way: An Ancient Monk’s Insights for a Balanced Life written by Lonni Collins Pratt and Father Daniel Homan, OSB. Today’s chapter and meditation is on prayer. Lonni Collins Pratt talks about prayer in the same way a young child knows that an adult is in the same place as she/he is. The child doesn’t have to say anything, but with her/his eyes and giggles she/he knows that there is the presence of someone in the same place. Pratt suggests that one of the reasons why our hearts are so calloused is because of all of the places in our lives that we do not look for God to be there. The poor, the sick, the suffering,etc. 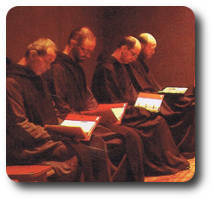 St. Benedict believed in the simplicity of prayer. His recommendation was that if someone wants to pray, that she/he should just pray. Keep it simple and short. Another way of saying this, is that if we want to seek God in whatever place or moment we find ourselves; all we have to do is pray. Prayer is not just some activity we do on Sunday, or when we are in trouble, or need something. Prayer is about deepening our relationship with God and one another. The more difficult we make prayer, the harder it will be for us to notice God in all the places where God is to be found. Sr. Joan Chittister, OSB acknowledges that we are searching for the God who has already been found, and that what may actually be happening is that God is searching for us, waiting for us to notice that God is there. In this season of Advent, let us watch for God in prayer by not hardening our hearts. My soul yearns for you in the night, yes, my spirit within me keeps vigil for you; When your judgment dawns upon the earth, the world’s inhabitants learn justice. (Isaiah 26:6 New American Bible). Our hearts yearn for all kinds of things. We long for wealth, prosperity, a car loan or a mortgage approval. We could gain everything and still feel empty. That emptiness that we feel is our desire for God. The desire for God within our heart and soul is there by God’s initiative. The choice we have is how we respond to that God given desire for love and pure holiness. St. Gregory the Great wrote of an experience St. Benedict had in Book II of the Dialogues. Long before the night office, the man of God was standing in his window, where he watched and prayed while the rest were still asleep. In the dead of the night he suddenly beheld a flood of light shining down from above more brilliant than the sun, and with it every trace of darkness cleared away. Another remarkable sign followed. According to his own description, the whole world was gathered up before his eyes in what appeared to be a single ray of light. As he gazed at all this dazzling display, he saw the soul of Germanus, the bishop of Capua, being carried by angels up to heaven in a ball of fire. (The Life and Miracles of St. Benedict, p. 71). When we recognize the yearning of our souls is for God, everything in this world becomes insignificant. The Holy Spirit leads us to the place of contemplative prayer, where God becomes everything that is important. During this Season of Advent we are watching in prayer to prepare to remember that God came among us in the Word made Flesh; Jesus the Christ. May we spend some time allowing that yearning of our souls to lead us to the refreshing waters of the presence of God in prayer and contemplation. Advent Reflection: Keep Awake. Be On the Watch. Therefore, keep awake– for you do not know when the master of the house will come, in the evening, or at midnight, or at cockcrow, or at dawn, or else he may find you asleep when he comes suddenly. And what I say to you I say to all: Keep awake. (Mark 13:36,37 NRSV). My readers can look forward to daily Advent reflections here. The constant theme that I will be writing about is watching and waiting. We live in the age of mass instant gratification. In many States you don’t even have to go in person to renew the registration and/or tabs on the license plate of your car. Just look up your local registry of motor vehicles on the internet, click, pay and they will arrive in the mail in no time. Combine the speed by which we can get just about anything we want with life itself being faster than ever; and waiting is more old fashioned than ever. There is a saying that goes: “Good things come to those who wait.” That is why this Season of Advent is such a fantastic time for contemplative prayer. Contemplative prayer does not come because we press a button and it appears. Contemplation comes because at a moment of God’s choosing, God infuses the waiting soul with that which cannot be seen, touched or smelled; but is very real and beautiful. The soul knows that God is so present that the only thing missing is a way to describe it accurately. One does not have to have her/his life in order. Nor do we have to have some theological mystery figured out. All we need is a heart that is quiet enough, a desire for God in the emptiness of ourselves and there God will be. The darkness becomes light. Despair gives way to hope. Everything that has been suddenly becomes insignificant. All that matters is God. In our watching and waiting this Advent, let us seek union with God as our only reason for living and breathing. May we know the presence of the Lord with every fiber of our being; even if we don’t know why it is that our being experiences the reality of God’s mysterious existence. All we have to do is watch and wait in faith, and God will be there before we know God is there.